After ending up with a bricked LG Optimus S the other day, I pulled Alec's old HTC Touch out of the mothballs as a quick stand-in. I have experimented with getting this WM 6.1 device to run Android several times (succesfully... see here) which it did a lot better than I expected. 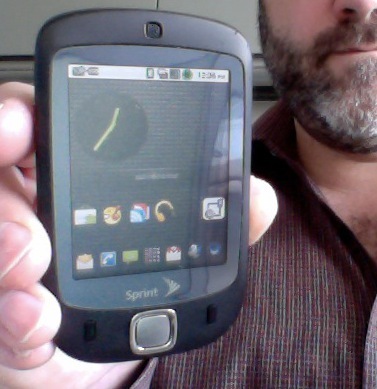 Now with getting used to Android on the Touch, and a few months with the Optimus, (plus time with iOS on my work-issued iPhone) I found that I had to flash the Touch back to its original WM 6.1 state to re-activate it. I cannot believe I ever successfully used this device without throwing it from a speeding train (preferably into the path of a second speeding train passing by). It once made sense. Once. Now I cannot begin to tell of the frustrations of trying to navigate emails and other necessities of the day on this thing. The browser is a cruel joke against humanity. Also the lack of a decent podcasting app (Google Listen is great on Android), and a Google Reader client were killing me. With that said, I will be trying out a Windows Phone 7 device soon. Stay tuned.